Police investigating a hit-and-run collision on the A22 Hailsham bypass near its junction with the A295 at the Arlington Eagles roundabout at 5.40pm on Saturday, March 10, have renewed a witness appeal after a car believed to have been involved was found burnt out at Downash, near Hailsham, just a few miles from where the incident occurred. 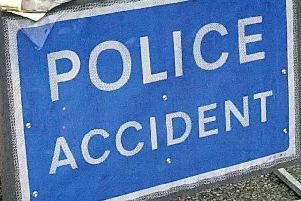 The vehicle was identified as a silver Honda Civic, similar to the car which failed to stop on the A22 after colliding with a northbound red Nissan Micra, which span into the central reservation of the dual carriageway, injuring its 35-year-old woman driver and her two passengers, girls aged 14 and 11. Officers have not ruled out the possibility of the burnt-out Honda being linked to the collision, and would like to hear from anyone who may have seen a silver Honda Civic being driven between the A22 and Downash, south of Hailsham, between Saturday evening and Sunday morning (March 10/11). Details can be reported online or by phoning 101, quoting serial 930 of 10/03. Police are most grateful to people who have already come forward to assist with their enquiries.